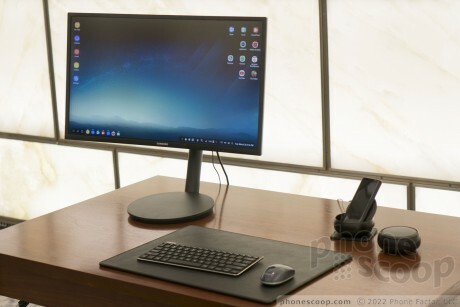 Samsung today announced DeX, a desktop accessory for the Galaxy S8 and S8+ that allows them to function as computers when attached to a monitor, keyboard, and mouse. DeX is similar in concept to Microsoft's Continuum product. For the S8 and S8+, the DeX includes HDMI, USB, Bluetooth, Ethernet, and cooling functions. The software relies on features baked into Nougat to help scale the Android user interface for desktop screens. It supports full multitasking with moveable windows and runs most standard Android apps. Phone apps, text messaging, and other essential mobile communications will all function normally. DeX and the S8/S8+ support Microsoft Office, with Adobe Lightroom and PhotoShop Express coming soon. A special Samsung browser provides a full desktop internet experience. Pricing and availability of the DeX are to be announced at a later date. So.. the same as the Moto Atrix? The same, except you know, it will work. Motorola had great ideas, they just ALWAYS had issue making them work in the real world. That's why they don't exist as anything other than a name anymore in mobile.